Serve up your favourite dips in style with Amalfi’s Acacia Paddle & Marble Bowl Set. 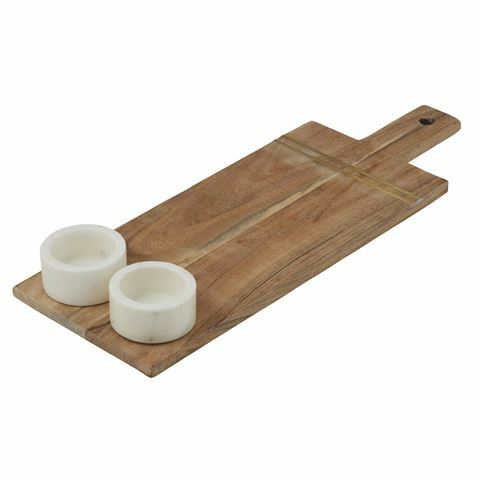 Included in this three-piece set is a paddle board crafted from acacia wood, as well as two small bowls forged from white marble – perfect for serving up appetizers. Crafted from acacia wood and white marble. Paddle board includes a convenient carry handle. Two small bowls for serving dips, sauces and more. 2 x Marble Bowls - 4cm (h) x 7.5cm (w). Acacia Paddle Board – 51cm (l) x 18cm (w).